I liked the pools, the breakfast's variaty and quality for a good price ( we stayed outside of the season and prices were lower than usual) so very good breakfast for few money! The hotel is very nice, the rooms are spacious and a good internet connection is available everywhere inside the hotel and also at the pools. A good internet conection is something appreciable because it is very hard to find on the island. Excellent value , great facilities, great staff , clean , great location. The hotel is lovely and clean, so many great facilities. The staff are lovely, couldn’t do more for you! The pools are so clean and the perfect temp to cool off. I don’t think they are heated though! Also a lifeguard is a great addition. The breakfast is plentiful and fabulous quality. Cocktails and drinks at the pool bar are a little pricier than in the marina but so tasty! We had two days by the pool and two exploring. Ate out every night so can’t comment on dinner. There is a gym, steam room, sauna and great kids room. For what we paid we were over the moon. Location wise it’s great, walking distance to the beach and marina. We hired bikes too, just a short walk away! Nice view from the balcony, delicious breakfast, comfortable bed. View, pool nice not overcrowded, no fighting for sun beds! The hotel looks clean and luxurious, its surroundings are well-kept including a shiny nice aromatic reception. We enjoyed ruch breakfast and BBQ night with delicious sangria. It was fantastic! thank you very much! we will come back again! 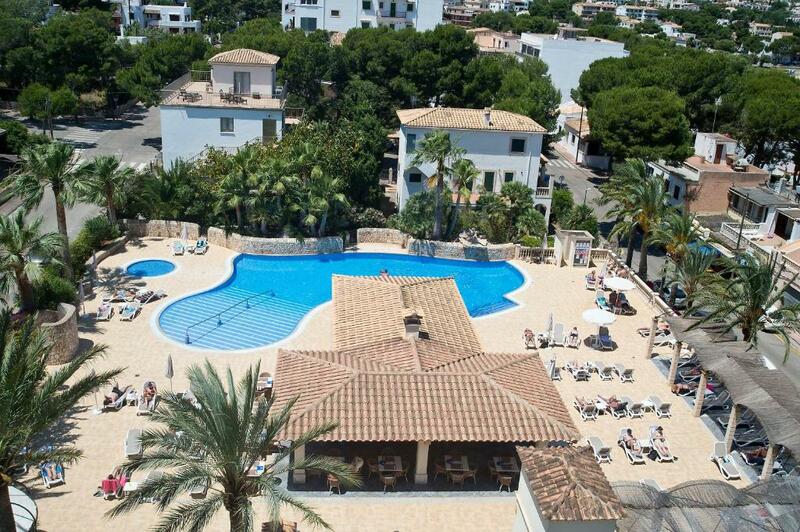 One of our top picks in Portocolom.The Hotel Vistamar by Pierre & Vacances offers impressive sea views from its quiet setting in Portocolom, 50 yards from the marina. This hotel features 2 outdoor swimming pools and a spa. 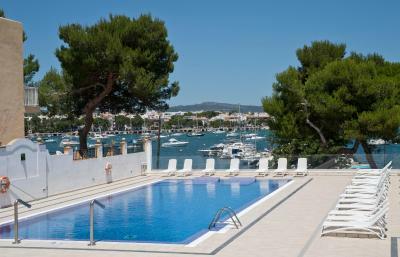 Rooms at the Hotel Vistamar by Pierre & Vacances feature stylish décor and each has a balcony. All rooms have satellite TV and a spacious bathroom. Some have sea views. Guests can enjoy traditional Spanish cuisine at the hotel’s buffet restaurant. There is also a poolside bar, which sells snacks. The spa has an indoor swimming pool, Turkish baths and a hot tub. It also offers a wide range of treatments and massages. There are also 2 tennis courts and a mini golf course on site. 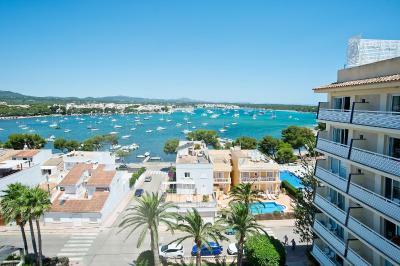 Portocolom is a quiet fishing village and the Vistamar is just 5 minutes’ walk from the resort centre. Cala Marçal Beach is just over 0.6 miles from the hotel. Hotel Vistamar by Pierre & Vacances has been welcoming Booking.com guests since 5 Jun 2009. 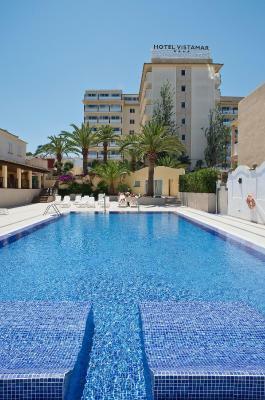 When would you like to stay at Hotel Vistamar by Pierre & Vacances? House rules Hotel Vistamar by Pierre & Vacances takes special requests - add in the next step! A damage deposit of EUR200 is required upon arrival, which is about GBP172.85. This deposit is fully refundable 0 days after check-out as long as there has been no damage to the property. Hotel Vistamar by Pierre &amp; Vacances accepts these cards and reserves the right to temporarily hold an amount prior to arrival. Hotel Vistamar by Pierre & Vacances accepts these cards and reserves the right to temporarily hold an amount prior to arrival. Please inform Hotel Vistamar by Pierre & Vacances in advance of your expected arrival time. You can use the Special Requests box when booking, or contact the property directly with the contact details provided in your confirmation. A damage deposit of EUR 200 is required on arrival. That's about 172.85GBP. You should be reimbursed on check-out. The fact the the walls are very thin and you hear your neighbor even when he whispers. The location is not the most beautiful one and there is no beach near by. Whitout a car I would not stay in Portocolom it is small and boring. The bedroom and bathroom could do with a revamp they look a bit tired, and the beds were quite hard! But you are hardly in them so it was ok. We were also close to the lift and could hear it every night. (Room 701) There are also lots of smokers, really noticeable when you come from the uk where smoking is banned. The staff at the hotel were pretty rude/indifferent to guests really. The hotel bar closed very early every night and there were many guests wondering what to do. The staff were almost rushing people out at 11am. The hotel is in a good location. 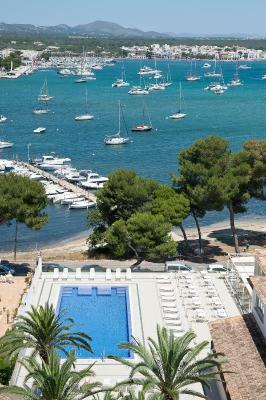 You are right in the middle of Portocolom, 10 mins to the closest beach. the town is lovely with many restaurants and bars. It's a great place to spend a relaxing couples break. Portocolom is very picturesque. The breakfast buffet at the hotel was surprisingly good. The pool is very nice. unfortunately we were put in the older building opposite. 4 flights of stairs no lift & no help dragging cases up there?!! No way could I walk up there all the time! I booked high room sea view but never expected in a 4 star that it wouldn’t have a lift up to the top! This building definitely wasn’t 4 star. Bathroom old & sweaty smelling plus air con was rubbish. Moved into main hotel next night. The room was a bit old, there were dirty spots on the curtains. Looked not as nice and cosy as on the pictures. Also the lights were too bright. The pool near the buffet was really nice. We were negatively surprised by the terrible chlorid odour in the room and the water smelled even worse, it was overwhelming and really unpleasant. Felt like we were constantly swimming in the pool of chemicals. The pictures from the advertisement are not real, you have to pay extra for the rooms with sea view which makes the price not worth it. One pool is only open from 12 to 18.00 and the other one from 10.00 to 18.00 which for me it doesn t make sense. 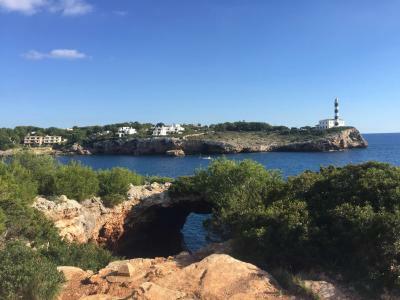 The location is dead, nothing to do close by, you have Cala Marcal but Porto colom has only few restaurants and some grocery shops so there aren t too many options. For a double room you have 2beds on rolls that are moving all the time, two persons cannot sleep proper in those beds because you might fall when the beds are speeding apart, fantastic adventure. The staff was really nice, that‘ s the only nice thing about the place but the hotel didn t impressed me much, actually o was quite disappointed.